Stanford’s beach volleyball team kicks off its 2018 regular season this weekend in Honolulu, Hawai’i, at the Rainbow Wahine Classic, where they’ll take on UCLA and host Hawai’i. Led by second-year head coach Andrew Fuller, the Cardinal enters the campaign as the 17th-rated team in the nation, according to the American Volleyball Coaches Association’s preseason poll. Stanford registered a program-record 13 wins in 2017, improving from a 5-12 clip in 2016. Pairs Morgan Hentz and Caitlin Keefe, and Courtney Bowen and Kat Anderson each won 13 matches as a pair, tied for second all-time. Four freshmen join the Cardinal for the 2017 season: Amelia Smith, Sunny Villapando, Kate Formico and Blake Sharp. Stanford welcomes back a large group of returners: Kat Anderson, Courtney Bowen, Payton Chang, Jennifer DiSanto, Morgan Hentz, Caitlin Keefe, Kathryn Plummer, Catherine Raquel, Chelsea Red-Horse Mohl and Shannon Richardson. Raquel is the lone senior on this year’s team, and Plummer is the reigning Pac-12 Freshman of the Year. Stanford will begin its 2018 campaign ranked 17th by the AVCA. The Cardinal finished the 2017 season unranked. Throughout the season, Catherine Raquel will write a weekly blog to provide readers with a behind-the-scenes look at the Stanford program. Raquel, the team’s lone senior, played in every match last season. She was named Pac-12 all-academic honorable mention in 2017 as a junior. 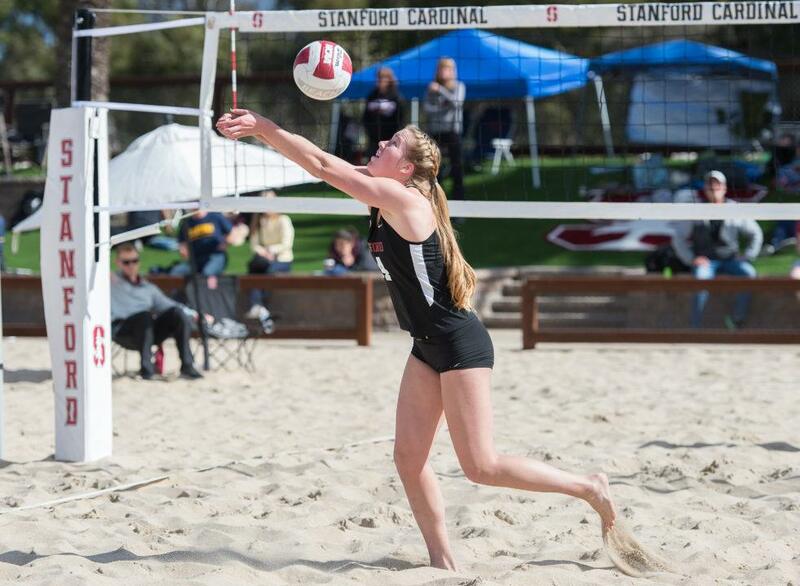 Stanford will host the Pac-12 Beach Volleyball Championship at Stanford Beach Volleyball Stadium from April 26-28. This is the first time Stanford has hosted the event, and this will be the third championship in the conference’s history. USC hosted the inaugural championship in 2016 and Arizona hosted the event in 2017. Stanford’s entire home schedule will be played at the Stanford Beach Volleyball Stadium. Opening in 2015, the stadium has four 75-foot long courts, grass berms for seating and is outlined with 10 palm trees to give it a ‘beach’ feeling, making it the premier collegiate beach venue in the nation.